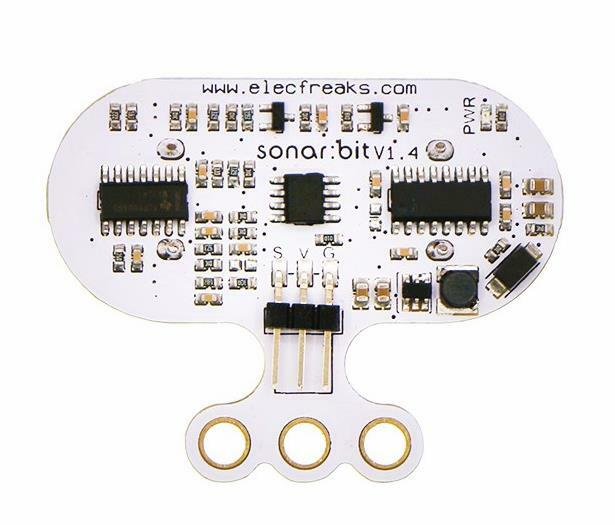 The ElecFreak sonar:bit Ultrasonic Sensor Distance Sensor for micro:bit is available to be used with a 3.3V or 5V micro-controller system. With only one 3-wire(GVS) cable, it can work properly. Compared to the normal 4-wire ultrasonic module, it has saved one IO port. The measurement range of sonar:bit is 4cm-400cm. It can output stable and accurate measurement data with ±1cm tolerance only. You can use this module to occasions like short-distance measurement, smart cars, robots, micro:bit and arduino teaching, etc..